OAKLAND, Calif. (AP) — Rich Hill played just long enough for the Oakland Athletics two years ago to get a feel for how they can come back when it’s close and win in the late innings, a signature of his former club this season. 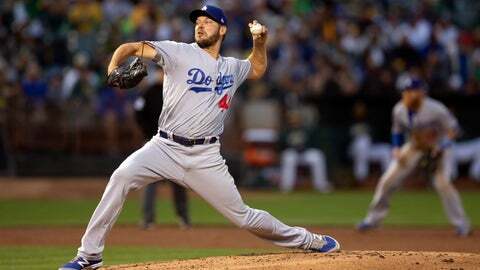 Hill pitched effectively into the sixth inning to beat his old team for the first time, while the offense manufactured runs to lead the Los Angeles Dodgers past the A’s 4-2 on Tuesday night to snap Oakland’s six-game winning streak. Hill (5-4) allowed two runs, three hits and four walks while striking out five over 5 1/3 innings. He is 3-1 with a 3.12 ERA in eight road starts. The left-hander hadn’t defeated the A’s previously in five appearances and one start. He won nine games for Oakland in 2016 before being dealt to the Dodgers. Khris Davis hit a two-run homer in the sixth — his 32nd — to get the A’s back in it and chase Hill. But the Dodgers put up a key insurance run on Matt Kemp’s RBI single in the seventh that followed a leadoff double by pinch-hitter Joc Pederson. Kemp ended an 0-for-10 funk. “To get a knock and drive in a run I know he was pretty relieved,” manager Dave Roberts said. No late-inning magic or dramatic finish for the home team this time. The Dodgers took a 1-0 lead against Sean Manaea (10-8) in the first on Enrique Hernandez’s RBI groundout. Los Angeles added a run on Austin Barnes‘ second-inning sacrifice bunt then Cody Bellinger’s RBI single in the third. Kenley Jansen closed it out with a pair of strikeouts in a perfect ninth for his 32nd save. Oakland had an eight-game home winning streak end. The A’s six-game winning streak matched their season high. Manaea didn’t make it through the third. Trying to win consecutive outings for the first time since a three-start winning streak from June 16-28, he was done after allowing three runs and five hits in 2 2/3 innings on 77 pitches. A’s starting pitchers had been 5-0 with a 0.73 ERA during the homestand as Oakland didn’t allow an earned run in a three-game weekend sweep of the Tigers. MC Hammer tossed the ceremonial first pitch on African-American heritage night at the Coliseum. Dodgers: RHP reliever Daniel Hudson went on the 10-day disabled list with right forearm tightness in a precautionary move after he struggled playing catch Sunday and again Tuesday. … SS Corey Seager had arthroscopic surgery on his left hip now that he is well into his recovery from Tommy John elbow surgery that limited him to just 26 games this season. The 24-year-old Seager is expected to be at full strength for the start of spring training. … Kemp, dealing with a bruised left ankle, returned to the lineup as designated hitter after sitting out Sunday against the Astros. … RF Yasiel Puig also was back after missing Sunday with right oblique soreness. Athletics: LF Chad Pinder came off the disabled list and batted eighth. He had been out since July 28 with a laceration on his left elbow. … Oakland optioned RHPs Ryan Dull and J.B. Wendelken and infielder Franklin Barreto to Triple-A Nashville, clearing room for the additions of new right-handers Shawn Kelley and Mike Fiers who came in trades over recent days. Kelley made his A’s debut in the sixth, escaping a bases-loaded jam and recording two outs with a walk. Dodgers: LHP Clayton Kershaw (5-5, 2.55 ERA), who made the rounds pregame signing autographs with lots of Dodger Blue in the Coliseum crowd, has never posted a decision in three previous starts vs. Oakland but owns a 0.87 ERA. He faces the A’s for the first time since Aug. 18, 2015. Athletics: RHP Fiers makes his A’s debut after being traded Monday by the Tigers. Fiers is 7-6 with a 3.48 ERA this season and 2-2 with a 1.96 ERA over his last seven starts.